Akkar District (Arabic: محافظة عكار‎‎) is in the north of Akkar Governorate of Lebanon. It covers an area of 788 km2 (304 sq mi) and has a population of 198,174. The capital is at Halba. The district is characterized by the presence of a relatively large coastal plain, with high mountains to the east. The largest cities in Akkar are Halba, Bire Akkar and Al-Qoubaiyat. Akkar has many important Roman and Arabic archaeological sites. One of the most famous archaeological sites and the birthplace of the Roman emperor Severus Alexander (d.235) is the Tell of Arqa near the town of Miniara. 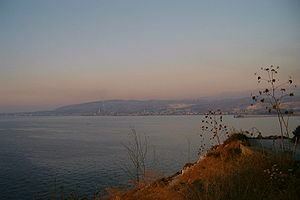 Several prehistoric sites were found in the Akkar plain foothills that were suggested to have been used by the Heavy Neolithic Qaraoun culture at the dawn of the Neolithic Revolution. The district only news agency is Sada Akkar, a local bi-weekly newspaper with an online website updated daily with the latest news from the region. The news agency focuses on social, economical and cultural news with less emphasis on the political news from the area, in attempt to reach a broader audience. The majority of the residents in the Akkar District is composed by a majority of Sunni Muslims, followed by a large minority of Greek Orthodox Christians. Maronites are the second largest Christian denomination, and have typically resided around the city of al-Qoubaiyat. Melkite Christians are also present in small numbers in the region. This region is also home to the largest population of Alawites in Lebanon. Turkish people form a majority in Kouachra and Aydamun.